Take on a interior painting project this winter. During the winter, most homeowners aren’t thinking about taking on any home improvement projects. If you’re hosting your family for holiday celebrations, there’s too much to do to bother with taking on a new task. However, if your winter is relatively quiet, then you can benefit from choosing the wintertime for your next interior painting project. Here are four reasons why winter is an excellent time of year for interior painting. If you have extended vacation time during the holidays in the winter, you’re probably not thinking about home improvement projects, but rather relaxing with your family. However, if you’re the type of person that enjoys beautifying your home and if you get bored during those long breaks, then winter is the perfect time for an interior painting project. Also, if it happens to snow and you get stuck inside, it will be a great use of your time. If you have little helpers available, you can give them something to do as well. If you’d rather get help from professional painters, you will likely see some good savings if you paint during the winter. Not many homeowners are taking on this type of work during this time of year, so there will be more contractors available for your project. Some estimates even show that you could save up to 40% by choosing to paint in the winter. You’ll benefit from the faster drying time that winter weather provides. Without the humidity of summer in the air, the paint will get the opportunity to adhere to your surfaces quicker. To get the full effect of this benefit, and to air out some of those unfortunate paint smells, you should open your windows and left the brisk winter air inside. 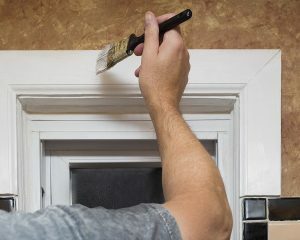 It may make your home a little chillier than usual, but if you’re doing the painting yourself, you’ll probably welcome the cool air. As you know, daylight savings time ends at the beginning of November. That means that the sun rises earlier in the day during the wintertime. This gives you the ability to start painting earlier in the day. Plus, if there’s snow on the ground, you’ll have plenty of natural light reflected into your home, allowing to truly see the brilliance of your color choice.